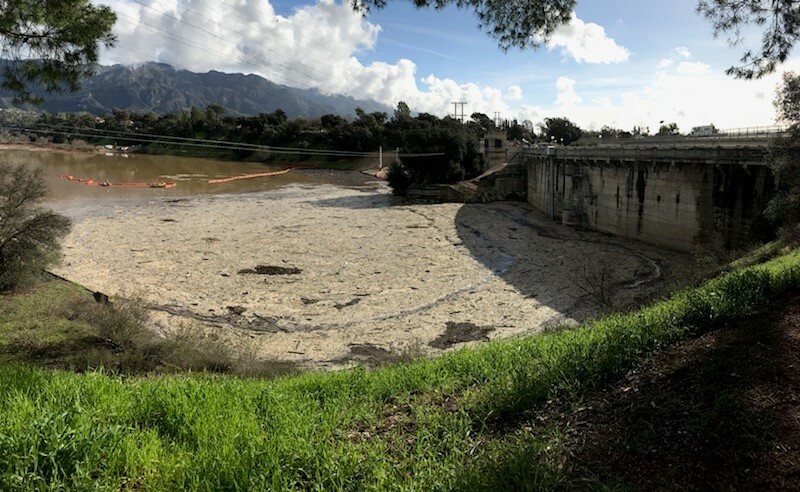 The Devil's Gate Reservoir Restoration Project is a four-year effort to increase flood protection for communities downstream of Devil's Gate Dam and restore habitat within a popular section of the Arroyo Seco Watershed. Los Angeles County Public Works will remove 1.7 million cubic yards of sediment from the reservoir immediately behind the nearly 100-year-old dam. In addition to providing flood relief to communities that have endured nearly a decade of elevated flood risk along the Arroyo Seco, the project will establish a permanent stormwater maintenance area that allows for the creation of 70 acres of enhanced habitat and recreational opportunities for local communities. Los Angeles County Public Works is removing recent storm debris from Devils Gate Reservoir. This is routine facility maintenance and not part of the Devils Gate Reservoir Restoration Project. The debris removal is necessary to safeguard downstream communities by maintaining operability of Devils Gate Dam and maximize storage capacity in the reservoir. Once removed, this debris will be transported to Scholl Canyon Landfill in the City of Glendale. County crews will begin hauling on Wednesday, February 20, 2019. Hauling operations will be limited to 7:00 a.m. to 3:30 p.m., Monday through Friday, for approximately 2 weeks. Additional debris removal work inside the reservoir may take place on weekends. LA County appreciates your patience and understanding during storm season. If you have questions about maintenance activities or would like to report a concern, contact Public Works Dispatch at (800) 675-HELP (4357). Los Angeles County Public Works has been actively planning for a more sustainable Devil's Gate Reservoir. In an effort to achieve balance between restoring flood protection to downstream communities and preserving the natural resources of the Hahamongna Watershed, Public Works will remove 1.7 million cubic yards of sediment over 4 years from the reservoir behind Devil’s Gate Dam. In addition to providing flood relief to downstream communities that have endured nearly a decade of elevated flood risk, the restoration project will create over 70 acres of enhanced habitat for wildlife. Habitat restoration activities have already started on the perimeter of the reservoir with the removal of non-native and invasive plant species within the Habitat Restoration Areas. In an effort to minimize the impact to the community, LA County Public Works in coordination with the Contractor, Griffith Company, are waiting to start initial construction activities until after the Thanksgiving holiday. Initial construction activities include vegetation removal from within the sediment excavation footprint and access road construction, with the sediment removal and hauling starting in April 2019. Starting the week of November 26, 2018, you will see equipment on-site and construction activities beginning, trails will be temporarily closed during weekdays, but open on the weekends. For more information you can view the Project Fact Sheet here. LA County Public Works is prepared to start work on the Devil's Gate Reservoir Restoration Project within the upcoming month. The first phase of the Project involves the restoration of over 70 acres of invasive vegetation with native habitat.